In celebration of the arrival of my cute lil’ Urara bento box set (box, strap, chopsticks, case, and bag!) I decided to make it color coordinated. This morning I fried up some asparagus and bell pepper (chopped last night) in olive oil, garlic salt, and toasted sesame seeds. On the bottom tray I put in the last of my kim chee crab, the last of the ahi shoyu poke, and some small cubes of tofu. I packed some soy sauce in one of my piggie bottles with the cap exchanged from the red piggie. The tofu expires today, so I’m bringing the rest of it in a separate container. I call it Kaolian’s bane because he can’t stand tofu and despises asparagus. 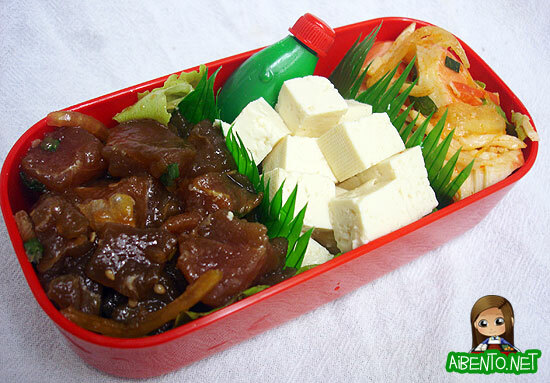 This bento was made using Bento Box #29 – Red Urara 2-Tier. 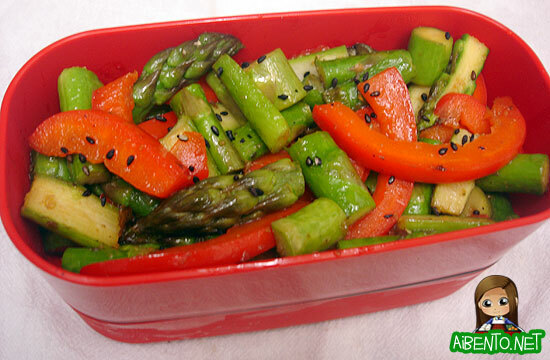 Click here to view bentos made using this box.